My version of spare ribs are spicy and sweet, using Korean red pepper paste (gochu jang). I measured out this recipe for the first time since I’ve always made this to taste, depending on how many ribs I was cooking. This recipe should feed 4 very hungry people (or 6 people who had a snack before dinner). Gochu jang is available at Korean and Asian grocery stores (and online, apparently). This red pepper paste is not for the weak-hearted. 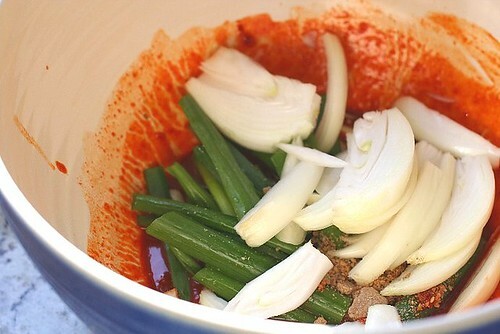 Combine red pepper paste, garlic, sugar, sesame seed oil and water in a large bowl until smooth and runny. Add scallions, onions and crushed sesame seeds to mixture. Add spare ribs and coat well. Refigerate for at least a half hour (I like to put them in for an hour). Heat up grill and cook on medium high, covered for about 6-8 minutes on each side, depending on your grill and the thickness of the ribs. You can cook the onions and scallions on the grill (they will fall through unless you use a grill pan), or discard. 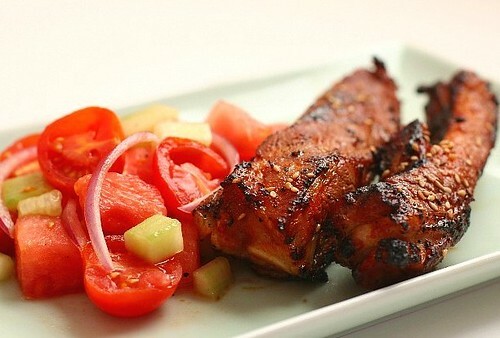 Sprinkle cooked ribs with sesame seeds, if desired. Serve with lots of moist towelettes. Something this spicy must be served with something to cool the tongue, and this watermelon salad fits the bill. 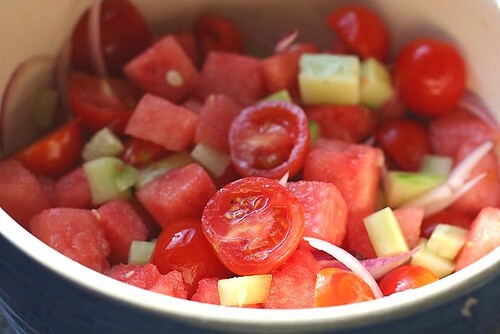 Combine watermelon, cherry tomatoes, red onions, cucumber, lime juice and olive oil in a large bowl. Season with salt and pepper and toss lightly. Cover and refrigerate for at least one hour. Serve chilled. I love Korean food…….and I love pork. What a great combo!! Can’t wait to try this!! The Husband would love the spicy ribs. I have made a watermelon salad with fresh w/fresh basil and balsamic vinegar. 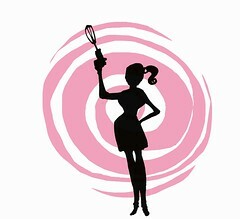 I am going to give your recipe a try. Your photos are fantastic! Oh nooooo, i might have to make something yummy tonight. thanks for sharing such an awesome recipe. Those spare ribs sound really tasty. Pairing them with the cool watermelon salad is perfect. Ohhh, now I have a huge craving from Korean BBQ…and it’s not even breakfast time yet! Perfect for the weekend. 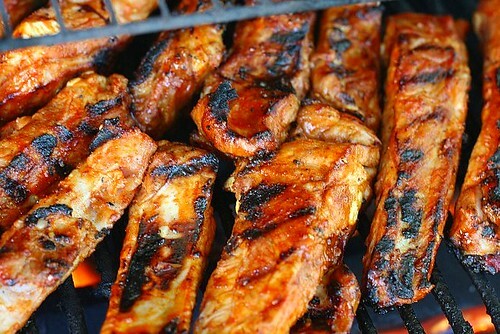 I’m doing your salad and your ribs for dinner Saturday night. 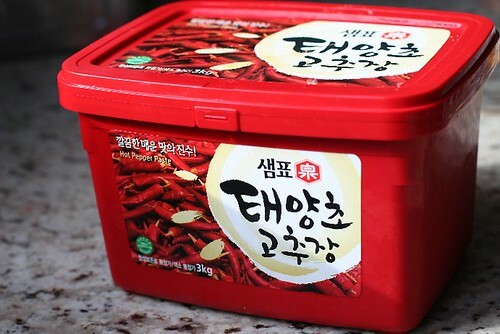 Korean red pepper paste rules! In Japan, Korean restaurants serve this dish called ika fei. It is squid sashimi with a mixture of veggies; greens, raw onions, sliced cucumbers and so on. 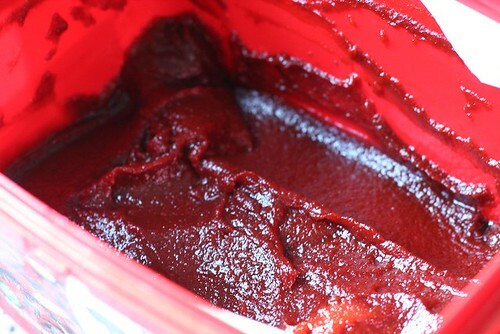 It is all stirred together red pepper paste and served. It rules! Is that an authentic Korean dish, or something only in Japan? Yes, this squid is often serve with red pepper paste. It’s the real deal! 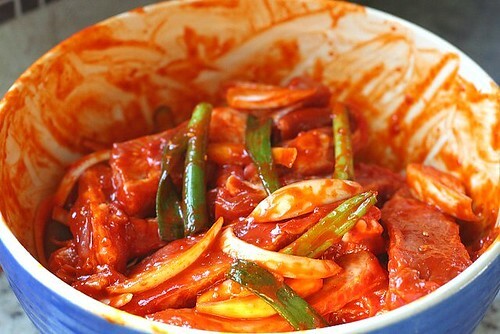 Exactly how spicy is the Gochu jang? Hotter than jalapenos? Yes, generally hotter and sweeter.